Bus from Kuantan to Kota Tinggi serves not just the commuters travelling between cities but also serves the travellers going to Desaru Beach in Kota Tinggi. The bus service is one of the important bus services in Kuantan Sentral which connects people to Kota Tinggi for work or for vacation in Desaru Beach. Maju Express and Plusliner are the two bus operators serving bus service from Kuantan to Kota Tinggi. Maju Express provides 5 daily departures while Plusliner provides 4 daily departures. The first bus service starts as early as 9:00am in the morning. The last bus leave Kuantan for Kota Tinggi at late night 11:45pm. There is no highway between Kuantan and Kota Tinggi. Thus the duration required for bus from Kuantan to Kota Tinggi is about 5 hours for travelling distance of 290 km. One washroom break will be given during the journey. The bus fare for this service is charged in a range of RM 26.50 to RM 29.10, depending on your selection of bus operators. Child fare is offered at lower price range by the service providers. The boarding point in Kuantan is located at Kuantan Sentral Bus Terminal. The arrival point in Kota Tinggi is located at Kota Tinggi Bus Terminal. Passengers arriving Kota Tinggi Bus Terminal can continue their journey to Desaru Beach to enjoy beautiful blue sky, white sandy beach, and sumptuous seafood feast. Planning to have a short getaway to Desaru Beach? 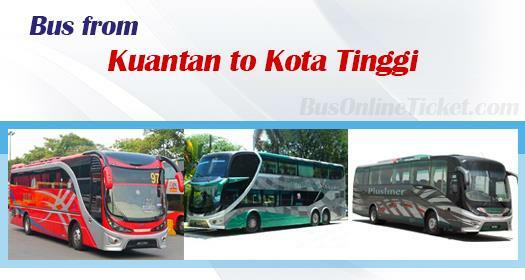 You can book your bus ticket from Kuantan to Kota Tinggi online now at our official website BusOnlineTicket.com or via our mobile app which can be downloaded from App Store and Google Play. Online booking for bus ticket is easy and convenient, your booking is instantly confirmed after payment is securely transacted in BusOnlineTicket Portal.